During the period of 9/21-10/8, I traveled to rural Uganda to train community health workers called VHTs and to spend many days in meetings in Kampala and Mukono shoring up our program. The trip went very well. We trained 38 VHTs, and planed expanding this program to the neighboring sub-county in Mukono. As always, the experience was a powerful one and reinforced my faith in the passion, intelligence and dedication of the rural Ugandans who run this program. This program began within the Brookings Institution's International Volunteering and Service Initiative. 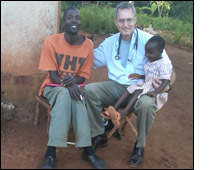 Since March 2008, Omni Med has partnered with local health officials, the US Peace Corps, Volunteers for Prosperity, and local & transnational NGOs to train community health workers, (called village health teams-VHTs) in the Mukono District of Uganda. These teams are comprised of local volunteers from the surrounding villages, who, once trained, provide valuable primary health care to the underserved population in the area. During my trip 9/21-1-/8 20100, we trained 38 more VHTs bringing our 2010 total to 401 VHTs trained. Since each VHT becomes responsible for roughly 30 households with 6 people per household, we have thus far impacted around 72,180 people. I have no doubt that we are making a significant impact on the health of those in the communities in which we serve. However, we are willing to put our ideas to the test. We are conducting a randomized, prospective trial to measure the program's impact on the health behaviors of local villagers, with data collection scheduled for January 2011. Easily preventable diseases ravage the population under five years old, resulting in an infant mortality rate that is the 33rd highest in the world. Across the country, only 42.7% of Ugandan parishes (townships) have access to a health facility. A large percentage of Uganda's rural population is effectively isolated from any sort of health care whatsoever. Yet a large body of research has shown that the interventions that save the most lives are inexpensive to implement and are applied at the household level. These are the interventions that we emphasize in this program model. I appreciate the opportunity the Benjamin Josephson Fund provided me in this trip to Uganda. I believe you are making a real difference in the lives of those who most need a lift. Thank you for the opportunity.